WASHINGTON – The United States Mint (Mint) will accept orders for the 2018 American Eagle One Ounce Silver Uncirculated Coin (product code 18EG) on May 24 at noon Eastern Time (ET). The coin will sell for $46.95. The Mint has produced the American Eagle One Ounce Silver Uncirculated Coin since 1986. It is the collector version of the Mint’s American Eagle Silver Bullion Coin and bears the “W” mint mark of the West Point Mint. The obverse (heads) design features Adolph A. Weinman’s full-length figure of Liberty in full stride, enveloped in folds of the flag, with her right hand extended and branches of laurel and oak in her left. The reverse (tails) design features a heraldic eagle with shield, an olive branch in the right talon and arrows in the left. Each encapsulated coin comes in a blue presentation box with a Certificate of Authenticity. The Mint accepts orders at catalog.usmint.gov/ and at 1-800-USA-MINT (872-6468). Hearing- and speech-impaired customers with TTY equipment may order at 1-888-321-MINT. Visit us online to learn about available shipping options. 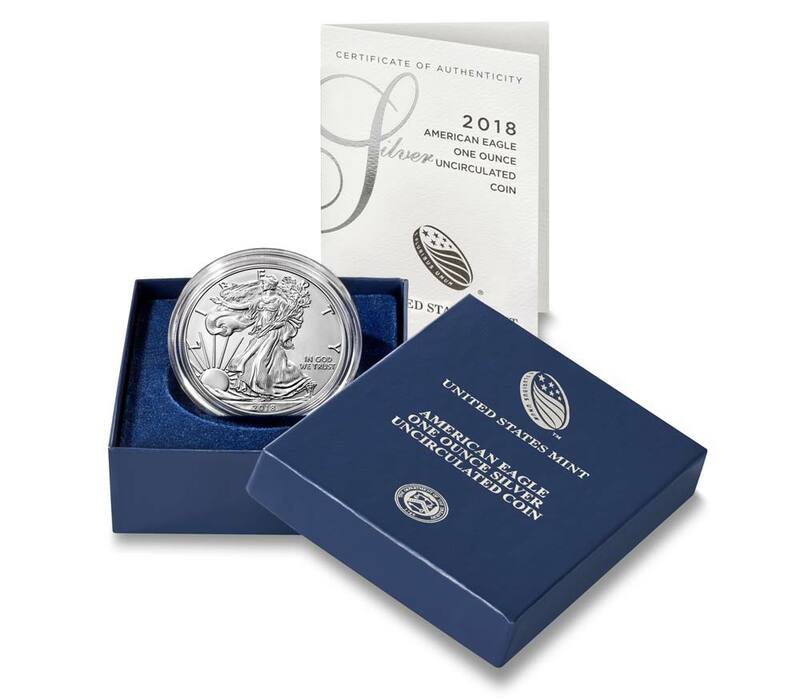 The American Eagle One Ounce Silver Uncirculated Coin is also available for purchase through the Mint’s Product Enrollment Program. View details about this convenient ordering option here.